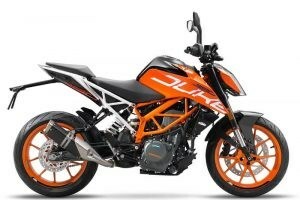 The 390 DUKE's meticulously manufactured, die-cast swingarm is designed and produced according to the same standards and principles as the one on the 690 DUKE R. This light alloy beauty with directly linked WP shock absorber excels in extreme torsional stiffness and outstanding tracking stability. Equally lightweight and delicate as they are stable, the 17 inch cast light alloy wheels are fitted with tires from the world’s best suppliers. They are 110 mm wide at the front and an impressive 150 mm at the rear. The tires are selected on the basis of their high grip levels in both wet and dry conditions, as well as their ability to provide supreme durability.